Sam Martin is a professional clarinet and saxophone performer, experienced on all instruments of the clarinet and saxophone families. 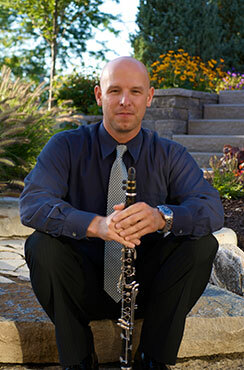 He is currently the Principal Clarinetist of the Rochester (MI) Symphony Orchestra, and the Second Clarinetist of the Warren (MI) Symphony, and has performed with most of the orchestras in southern Michigan including the Detroit Symphony Orchestra, Detroit Chamber Winds and Strings, the Ann Arbor Symphony Orchestra, the Flint Symphony, and the Saginaw Bay Symphony Orchestra. He has performed on both clarinet and saxophone with theater orchestras at the Foxand Fisher Theaters in Detroit. He also performs with his wife, flutist Kassia Martin, as the Martin Wind Duo. Mr. Martin has been teaching privately for over 20 years. His students regularly receive First Division ratings at Solo & Ensemble and perform with youth orchestras including the Detroit Symphony Orchestra Civic Ensembles. Many of his students have been awarded scholarships, including awards to study music at the University level. In the past, Mr. Martin has been a member of the Augusta Symphony Orchestrain Georgia, the Colorado Springs Symphony Orchestra, the Central City (CO) Opera Orchestra, and the Michigan Opera Theater Orchestra. He has also served as a faculty member at the Rocky Ridge Summer Music Camp in Estes Park, Colorado. He holds a Bachelor of Musicdegree from Wayne State University in Detroit.